The magic of roulette is definitely incomparable, even if one is an experienced gambler, and has already tried everything from traditional blackjack and baccarat variations to exciting highly-modified slots. This is, perhaps, why the game has earned tons of fans all over the world, and the number of its admirers is likely to increase in future. Having begun its history back in the 17th century, the game of roulette hasn’t changed greatly, and is now represented in two basic modifications, American and European roulette, the latter being rarely offered to play in the US live casinos. At the same time, as far as modern reputable gambling sites are regarded, the players are generally presented with an option to play both versions. 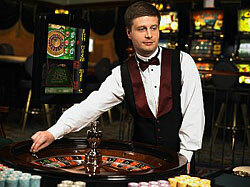 Despite the fact, that the essence of the game eliminates a possibility to use some unique advantage play techniques, there can, of course, be defined a range of useful roulette tips, which could possibly help the player to win, or at least not lose much, especially if he/she is a newbie. Comprising useful guidelines, concerning all gaming options, offered in any casino of the world, general gambling tips will, certainly, help roulette players as well. No matter if it’s a land or an online casino, which one wishes to play within, European roulette appears to be the very best option for all gamers, much due to the absence of “double zero” pocket on the wheel. As the house edge in European roulette is almost twice less, than in American modification, all players are advised to stick to playing the former only. Surrender option is usually applied to outside bets, like Black/Red, or Even/Odd, for instance, and presupposes one’s ability to save half of his/her bet, if “zero”, or “double-zero” wins. Therefore, if one’s a beginner and is afraid to lose much at the very start, the Surrender option is really worth trying. “En Prison”, although being used in European roulette only, is, actually, a wonderful opportunity to save the player’s money. Its essence lies in the fact that if one’s “zero” bet on doesn’t win; he/she has an option to “imprison” it till the next spin. Then, if it wins - the bet value will be returned to the player. All things considered, the vast majority of roulette tips are quite simple, so can be easily understood even by those gamblers, who have never tried to play the game yet.